When you’re a business of one, it’s very important to put the best business practices in place early on. You have to play many roles when you’re a freelancer, and you want to do the best you can at them all. 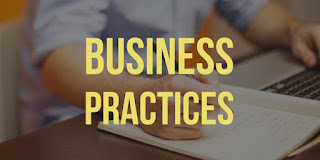 Integrating business practices that benefit you and move your business forward will save you time, money, and sanity in the long run. The earlier you can implement these standards into your business they better off you’ll be. Build your name as a composed freelancer and you’ll find that it comes back to you 100%. These are the best business practices to use as a freelancer. Following up sometimes feels like all I do as a freelancer. Everyone’s inbox gets overloaded easily. We sent and receive hundreds of emails a day. Sometimes your original pitch or introduction gets overlooked. Following up shows the client three important things about yourself. Communicating all this in a single email is a powerful message to send to potential clients. It sets a good standard for your business together. Follow-up emails are also a freelancer’s bread and butter. Following up with people is one of the best ways to actually build your client roster and portfolio. Without following up, you might send 100 pitches and only hear back on two. Sending another email to check on your first delivers a much high rate of return. Basically, follow-up emails make your wallet happy. To quote Queen Bey, ‘Always stay gracious.’ Even if you are upset or angry with a client, it’s best not to show that. You can be clear and firm, but you can never be rude. If you have a client that is treating you poorly you have the responsibility to be the bigger person. Keep the tone of emails polite, and use facts to make your arguments. Point to the good work you’ve done to support yourself. If the relationship becomes totally untenable, walk away from it. It’s better to break ties before things become nasty. When you’re a freelancer, word of mouth and reputation are everything. They can bring you clients, grow your brand, and expand your whole business world. It’s very important that you deliver quality work consistently. Meet deadlines, answer questions that your clients have, and be flexible on feedback. You want to be known as reliable, professional, and polite. You don’t want to be known as flaky, or someone who delivers poor quality work. Word of mouth is a powerful tool that can grow or destroy your business. If you get a reputation as someone that no one wants to work with, no one will want to work with you. Just like you need to stay polite in your communication with clients, you need to protect your name. If it becomes apparent that you can’t complete a job, or that you need to adjust terms of a work agreement, make that clear early on. It’s better to be upfront with clients than to end up disappointing them when you can’t deliver. Probably the biggest mistake I made as a business owner early on was thinking that I was an island. I had it in my head that I had to do everything myself, and that I had to come up with new ways to run my business. That was, in a word, stupid. There are a million small business owners out there who are already doing well. Follow in their steps. You don’t need to blaze your own trail when it comes to the nitty-gritty of your business. If you’re trying to build an email list, use a company like MailChimp or Convert Kit. If you’re trying to invoice clients, use companies like Due. You don’t have to bear the burden of doing everything yourself. Use existing tools. Ask for help when you need it. Outsource if you can afford it. Focus on what you do best and what you want to see your business succeed at. Being a freelancer is a roller coaster. It’s a journey that will change your personal and professional world. Working for yourself is a totally different world than working for a company. Freelancer’s play by their own rules. It’s both a blessing and a curse of being a freelancer that you design everything about your business. So you want to make sure you’re putting your best foot forward by using the best business practices for a freelancer. If you put good business practices into place and stick by them, you’ll be all set. These habits will not only help you grow when you first start off but will keep your business thriving in the long term.